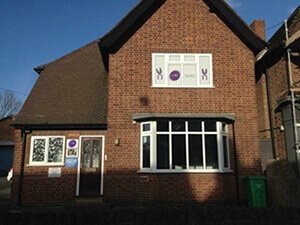 The original Adjust Massage clinic was set up in 2014 and is located only a few minutes’ drive from Nottingham city centre in the quiet residential area of Lady Bay, West Bridgford. There’s free on-site parking and free street parking if required. We have three rooms at this clinic: 2 bright and spacious treatment rooms where we offer our sports massage, deep tissue massage, gait analysis and biomechanics assessments, and 1 holistic room that has a heated memory foam massage couch and ambient lighting. This is where our more relaxing massage treatments such as pregnancy massage and reflexology take place. We have a small waiting area downstairs that you can use if you arrive a little early for your appointment. Simply ring the doorbell for your therapist, let yourself in (the door will be unlocked) and take a seat. Your therapist will come down and collect you when it’s time for your appointment. Toilet facilities are available upstairs next to the treatment rooms. Sports Massage - A strong massage, focused on one or two specific areas of the body where you are experiencing an issue/injury. Deep Tissue Massage - A general, strong massage, where the pressure can be altered to suit your preference. The aim of the massage is to reduce muscular tension, with less of a focus on one area. Swedish Massage - A full-body massage using oil and a lighter pressure, to provide a relaxing experience. Indian Head Massage - This massage helps you to de-stress by applying techniques to the scalp, back, neck, arms and face. Pregnancy Massage - Designed especially for prenatal ladies, to relax and help reduce pregnancy aches and pains. Back Massage - Available as a stronger or more relaxing massage, this 45-minute massage focuses just on the back. Hot Stone Massage – A body massage using oil and warm basalt stones. Reflexology – This works with the pressure points of the feet, stimulating the healing processes of the body and aiming to bring the body back into balance. Appointments are available at this clinic with James, Hayley, Clare, Imogen, Anna, Jack, Laura, Gemma, Jen, Sarah, Chloe, Heather, Bart, Andy, Chris and Helen. You can book online or call us on 0115 8373553. From Nottingham city centre, head for the Motorpoint Arena and then take Manvers street. At the junction next to the Harley-Davidson showroom, get into the third lane and go round the island. Follow the road round to the left at the Lady Bay Retail Park and then turn left to go across Lady Bay Bridge. At the next set of traffic lights, turn left into Trent Boulevard. The clinic is on the left just past the primary school and is right next to the Co-Op.